Help children ages 6–10 explore their emotions and communicate their feelings in uplifting, encouraging, and age-appropriate ways. Magnificent Marvelous Me! was created to help children ages 6–10 explore their emotions in uplifting, encouraging, and age-appropriate ways. Its over 40 drawing and coloring activities engage and invite them to communicate their needs and engage in a conversation about how they feel. Each activity is based in therapy, providing a safe place for them to explore and express what’s in their hearts. 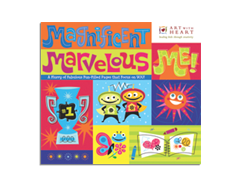 Download the Second Step and Magnificent Marvelous Me! Crosswalk (PDF) to learn how they align. All proceeds help Art with Heart help more children through the power of creativity.